Spring Creek, NV 2008-06-16: This event took place when I was about 15 or 16 years old living in Spring Creek, Nevada. Its a very small town about 10 miles from Elko, Nevada. I was staying at my friend's aunt's house and that is where I was living at the time. I slept on the couch in the living room normally because there weren't enough rooms at her house. One night I woke up at 3am for no reason. I looked right into the kitchen from the couch and noticed the time. Then, I swung my head to my left and instantly jumped and froze with fear as I noticed the living room door was open so wide it was touching the wall and standing in the living room doorway were three, four foot tall beings with heads too large for their bodies. One was standing in front and the other two were about 1 foot behind the front one and on the left and right side. There was a light coming from behind them shining through the door that was a white color with a tint of light blue. I was unable to make out their facial features due to the lighting coming from only the back of them but there was no question they were there standing clear as day. As soon as I noticed them and jolted from fear the front one zoomed over to me on the couch. I didn't notice how it moved because it was so quickly standing over me as I remained laying there. I looked up at it and of course my adrenaline was pumping. I felt a little hand rub my cheek in a comforting way and in my head I instantly told myself "it's okay." Not even kidding the second it touched my cheek my adrenaline stopped and heart rate went back to normal almost instantaneously which I still don't know how that is even possible. It's like it controlled my emotions by touching my cheek. The feeling I got when it touched my cheek was overwhelming love and comfort and happiness. It's like it was telling me to not be worried and it meant no harm. The weirdest thing is that I even looked up at it and smirked with comfort and new it was okay to go back to sleep. Who would go back to sleep with some foreign being standing right above them? The whole encounter lasted only but 30 seconds or under. - If you believe non-terrestrial beings exist, what do you think they are? - How do they get here? 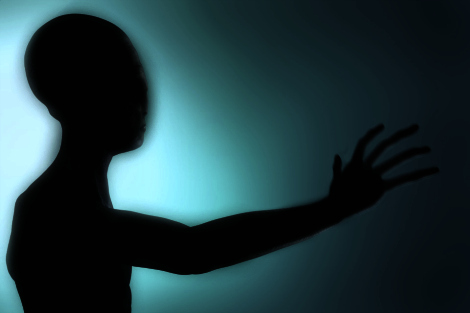 - Are alien abductions a reality? - Why are these abductions occurring? - Have you ever had an encounter? Could you detail the incident? - Do you know other people who claim that they have had an encounter? Could you detail what you were told? - To what extent is the government suppressing information from the public? Sasquatch: Square or Sloping Shoulders?